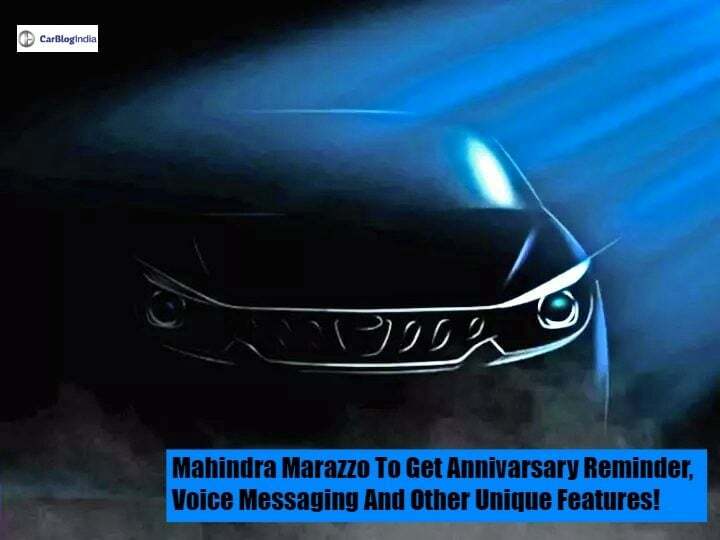 The entire variants and feature list of Mahindra Marazzo have been leaked. It gets some unique features like anniversary reminders and voice messaging. The MPV is set to launch on 3rd September and the expected price is between Rs 13 Lakhs to Rs 18 Lakhs. Yesterday, we gave you Mahindra Marazzo’s clear photos without any camouflage. Now, 3 days before its launch, Autocar India has revealed Marazzo’s variant and entire feature list. Now, as we see the feature list, it gets some premium features. It also gets Anniversary, Birthday and meeting reminders which is a segment first feature. Also, it gets the unique feature of Voice messaging, which is not found in many cars. It will come in four variants – M2, M4, M6, and M8. It gets dual front airbags, a passenger airbag off-switch, a speed sensitive door lock/unlock feature, ABS with EBD, brake assist and ISOFIX as standard fitments. As the initial stocks and demo cars have arrived at various dealerships, the bookings for the same have begun at a token of Rs 10,000. As we can see, most of the necessary features are found in the M6 variant itself. The top-spec trim gets important features like Reverse parking sensors and LED DRLs. Mahindra Marazzo will get a 1.5 Litre four-cylinder diesel engine as of now. The engine produces around 130 BHP of power and 300 Nm of torque. However, there are no such confirmations about a petrol variant in the lineup. It comes mated to a 6-speed Manual transmission. Sometime later, it will also get Automatic Transmission. Now we have the interior photos, exterior photos, variant and features and the launch date. So, the wait is just for the price, which will be out on 3rd September.